Rain or shine, sleet or snow – he was always there. Sitting on a bucket-turned-upside-down as a stool, I would drive past him on my way to the post office in the small community where I live. He always made eye contact. He sometimes smiled. He usually waved or nodded cordially in my direction. Once he tried to bum a cigarette from me, but I was powerless to help him out with that one. He was a fixture there, at the crossroads of neighborly concern and I’m-late-for-an-appointment, but until yesterday, I didn’t even know his name. It was Bob. And it made me sad. It makes me sad. And it makes me ask questions – some of which make me uncomfortable today. What was my responsibility to Weed-Wacker Bob? What I mean is – as a child of God with resources to share, should I have given him something? The only thing he ever asked me for was a cigarette. And the opportunity to whack my weeds. I gave him neither. Instead, I smiled and waved and drove right on by. Year after year. After year. How did he die? I wonder. Was he alone? Did he have a family? Friends? Loyal landscaping clients? There must have been others who actually stopped and talked to Bob, maybe giving him a job or a ride or a cigarette. Right? Someone else surely has been picking up the slack all these years for Weed-Wacker Bob… They must have! But what if I’m wrong and everyone else on their way to the post office smiled and waved and drove right on by – just like me? I am faced on this day with a mirror of sorts, found in the pages of God’s Word. I don’t need to ask myself what I want from others – I know I set the bar high in that department. And there was clearly no initiative-grabbing going on in my head – no doing-it-for-them as I smiled and waved and drove on by. And this is not okay. I am not okay! I am disobedient, selfish, apathetic and lazy, but I am not okay. That is good news, because today I’m feeling pretty darn less of and in desperate need of God’s more-than-enough. 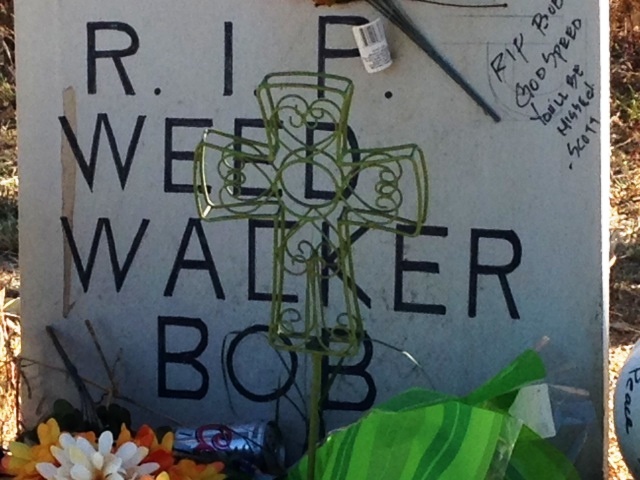 Rest in Peace, Weed-Wacker Bob. Rest. In. Peace. This entry was posted in Uncategorized and tagged charity, Christian duty, generous living, roadside memorial, Weed Wacker Bob by Pink Shoes Ministries. Bookmark the permalink. Wow. Thank you for sharing that. We sure can’t take things for granted. Sometimes we just have to do something TODAY, don’t we? You gave a smile and wave – don’t forget that. Thank you, Beth! I am just so aware of how much we take for granted, you know? This is something I needed to feel in order to learn, I guess. Thank you for responding – your friendship is a gift to me!